Tired of that old linoleum? We have all the tools you need to rip out the old and put in the new. We have a wide range of installation tools for carpeting, wood flooring, tile, and – of course – linoleum. Anything is possible with a little effort and the right equipment! Each of these essential carpeting tools are available for a low price. Essential for laying carpet, our Crain Carpet Kickers, Seam Irons, and Trimmers are the first choice of professionals and homeowners alike. Design features inset axles to prevent scuffing. Our 100 LB linoleum rollers have segmented rollers which help exert even pressure on uneven surfaces; the inset axles won’t scuff your walls either. We carry a variety of manual tile cutters. We have a variety of “score and snap” ceramic tile cutters; the largest manual tile cutter is capable of making 17” rip cuts and 12” diagonal cuts. Another simple but essential carpeting tool. Our Crain stair tool is made of nickel-plated alloy steel and will withstand the toughest hammer. The tapered end is designed to not cut carpet. Rental includes cost of diamond blade usage. This Target wet saw will cut any type of tile up to 3/4” thick. Its sliding tray allows for rip cuts up to 18” long and diagonal cuts up to 12” long. Disassembles for easy transport. Built for high production sawing, the Husqvarna Super Tilematic TS 250 XL3 is designed to cut big tiles and to deliver the required cutting power. Rip cut a 34” tile in one pass or diagonally cut a 24” tile. The sliding water pan allows instant adjustment from small to large material for unequaled productivity and convenience. Includes a folding, wheeled cart for simple transport. Rental prices includes blade rental. Our wet tile saw will cut tile that is up to 1-3/8” thick of any length. A guide also allows for 45-degree mitre cuts up to 1” deep with its 7” diamond blade. Rental includes cost of diamond blade. This lightweight portable tile saw features a 3/4 HP, 6000RPM electric motor powering a 7” diamond tile blade. The sliding tile tray will allow rip cuts of up to 17”, and diagonal cuts up to 12”. Also includes a 45- and 90-degree rip guide/miter block for angled cuts. The Turbo Dryer is often combined with a heater to increase drying time. Designed to move large volumes of air at high speeds in order to increase evaporation; the Turbo Dryers’ low profile dries floors quickly and quietly. Designed for vinyl tiles up to 12” wide. Calibrated within +/-0.005”, our Crain “Model A” vinyl tile cutter has the precision professionals demand. Cuts vinyl tiles up to 12” wide. Our dehumidifiers are tested after every rental to ensure maximum extraction. The dehumidifier is the central tool in any closed-air drying system. Built to extract large volumes of water vapor from nearby damp materials. 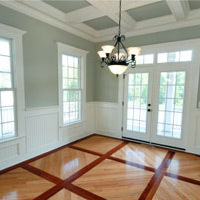 Cuts a wide range of products, including flooring, siding, and roofing materials. Great for cutting laminate and hardwood flooring – as well as roofing and siding (including HardiePlank®). This model will cut up to 13” wide and 1” thick on many products. This simple-to-use tool also features a built-in ruler on the table and an extension handle for extra leverage. Clog-free, easy to load design. Used for decking and sub-flooring, the P13 stand-up screwgun features tool-less countersink adjustment and jam-free operation. Handheld design; runs 4” × 24” belts. Our variable speed Bosch belt sander runs 4” × 24” belts, and is great for both preparatory and finishing work. Very powerful and easy to operate, this model is capable of sanding a 2×4 in a single pass. Walk-behind model; runs 8” wide belts. The Clarke DU-8 drum sander is great for heavy-duty jobs. The 8” wide drum is powered by a 110 V 1.5 HP electric motor. Weighs 105 lbs. Handheld design; runs 7” diameter discs. Our Clarke Super 7R Edgers are versatile and powerful machines, designed specifically for sanding around the edges of a room. Handheld design; holds 4-1/2” × 9” paper. This single-speed handheld orbital sander finishes polished wood surfaces and sands various wood and sheet metal materials prior to painting. Walk-behind model; holds 12” × 18” paper. Our easy to use orbital sander is designed for indoor sanding, while the built-in vacuum helps keep dust down. Weighs 123 lbs, fits 12” × 18” paper. Handheld design; holds 5” diameter discs. Our random orbital sander uses a hook and loop method to grip 5” sanding discs. An ideal finish sander for carpenters and woodworkers. Cleaning chemicals also available in-store. These powerful and simple carpet cleaners feature a unique rotating head for the deepest clean possible – professional-quality results! Designed to handle drywall and concrete dust. Our Bosch dry-dust vacuums are designed to handle the toughest materials, such as drywall and concrete dust. This walk-behind floor stripper will remove carpet, linoleum, and tile, as well as adhesive materials, from both hardwood and concrete surfaces. Note: rental rates do not include blade rental (see below). Walk-behind model; runs 15” diameter discs. Called the “Best in the Industry”, our Clarke 1500 Floor Maintainer runs 15” diameter polishing pads to buff your surfaces to a shine. Handheld design; holds 8” blades. One blade is included with rental. These tools feature an 8” wide heavy-duty replaceable blade – their twist-lock adjustable telescoping handles save a lot of crawling. Large capacity, commercial wet/dry vacuums. We stock Pneumatic wet/dry extraction vacuums that have been specifically designed for commercial use – 15+ litre capacity (wet).